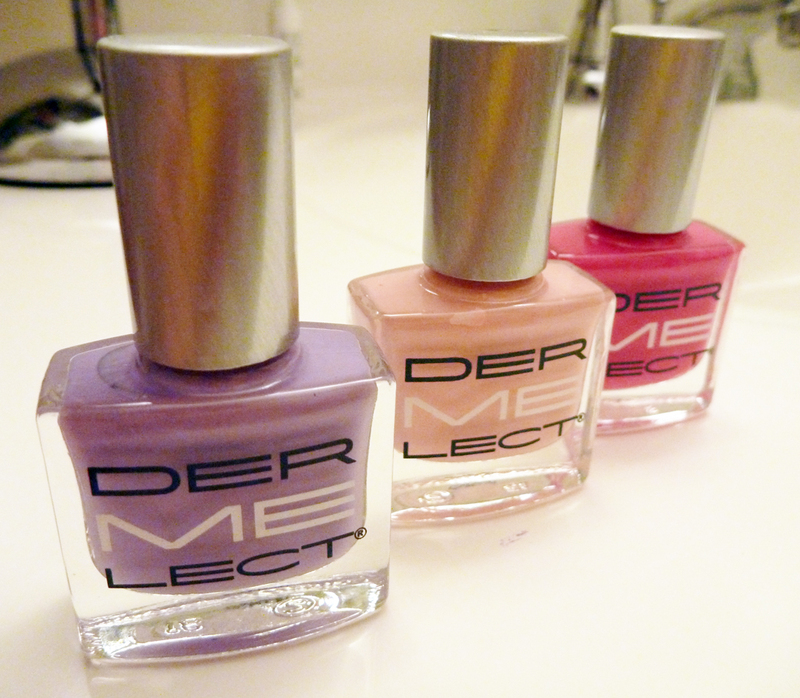 I got 3 of Dermelect's new ME Peptide-Infused Nail Polishes :) The colors I received were Persuasive (light pink), Luxurious (lavender), and Provocative (magenta). Now, these are not just normal nail polishes - the peptides that are in the polish helps to strengthen nails while still resisting chipping and remaining flexible. These are some nice claims, so I really wanted to put them through a good run and see how they hold up. First I did my toes - I love having polished toes :) The nail polish is designed to be worn with 2 coats - the first coat bonds to your nail so it holds up well and the second coat bonds to the first coat and it's the second that gives you the flexibility and chip resistance. I just took a toothpick and dipped it in the petal color. Then hold the toothpick at a 45° angle and lightly tap down - the pick will create a nice oval that fans out slightly - perfect for flower petals. Let the petals dry and then take another contrasting color for the center and just drop a little dot. That's it! It's like nail art for dummies. Believe me, if I can handle it you can. I used Persuasive for the petals and Provocative for the center dot. Next, I had to tackle my finger nails. Let it be known that I have not painted my finger nails in a few years and that was only for a Halloween costume. Seriously, I hate painting my nails. My experience has never been a pleasant one due to my daily activities. I work in a jewelry store and I am constantly having to open clasps, open lockets, change watch batteries, clean things with solvents, etc. Lots of things that really aren't so good for keeping polished nails looking nice. I always end up chipping the polish the day after I paint them and then I am just mad because they look so bad until I can finally take the polish off. So, I decided to do something that is very in right now (at least it seems that way on Pinterest), but that would also be very simple - introducing the Simple Chevron Nails. I began by just painting my nails. I used Luxurious as my main color and painted just my ring finger on both hands with Persuasive. I did get a little on my skin, but since I painted them at night I just went to bed and didn't worry about it. 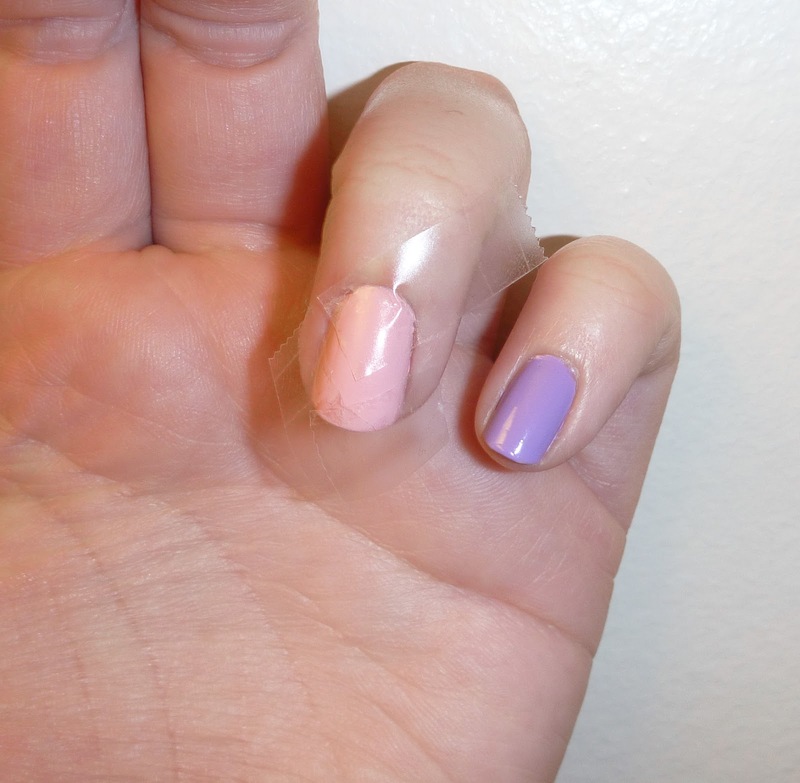 While I was in the shower the next morning, I peeled off the excess while my hands were really wet - so easy. I was really worried about the polish not wanting to dry while I was at work and I didn't want them to look bad, so I didn't do my 'art' until night time of the next day. I used clear scotch tape to mask off the chevron stripe. I pulled off about a 1.5" long piece, cut off the perforated edges (making sure they were straight), and cut the tape in half length-wise. I then cut it into 4 pieces - 2 that were 1" long and 2 that were 0.5" long - and lined them up on my nail. I made sure to really press into the creases of my nail beds to make sure my edges didn't get sloppy. Next, I carefully painted inside the exposed area with Luxurious (to tie into the rest of my hand). I left the tape on and let the polish dry for a few minutes. The polish was mostly dry but slightly tacky when I took off the tape. And this was what it looked like - not so fantastic. The Dermelect is nice, but because it adheres to itself so well, it made a very rough edge when I pulled off the tape. 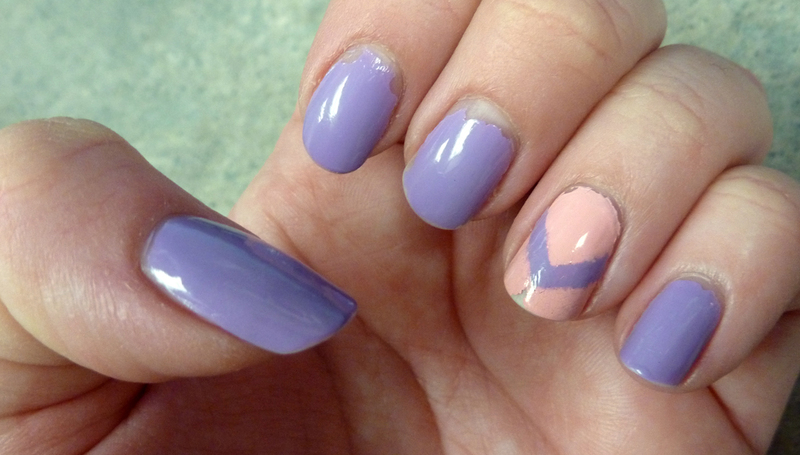 Also, the purple strip was a pretty noticeable step above the rest of the nail. So, I took a tooth pick with just a little bit of pink color on the tip and neatened up the obvious rough areas - this part was the biggest challenge but it went ok. Once my nails looked reasonably better, I topped it all off with a layer of clear coat to smooth down that edge. Here is the final product :) I know it's not from-the-salon-perfect or anything, but for someone who is nail-painting-deficient like me this is a huge triumph! Another important thing for me is how well the nail polish performs, and I have been really happy with this one. They really no keep your nails flexible, which really helps to prevent chipping. I did get little lines and raised bumps as time went on, but nothing that you would even notice just to see my nails at a normal distance. The wear that occurred was at the tips of my nails. 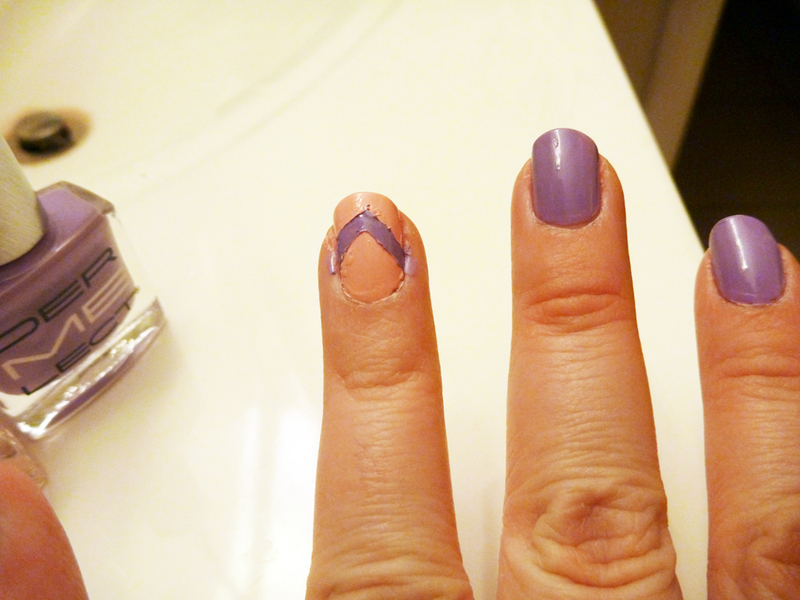 Also, the top near my nail bed began to flake off a little as the nails grew down. This is a photo of my toes 2 weeks after painting them. Again, you can see a little bit of wear at the tips of a few nails, but overall they held up better than my fingers. I give this product 5 out of 5 stars! It really does keep your nails flexible to avoid chipping and it is pretty long lasting. It was easier to apply without making a mess and simple to do nail art with. 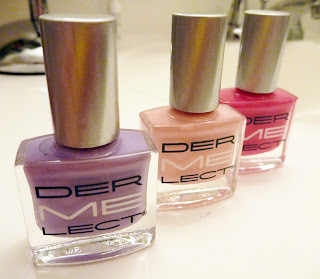 I would definitely use these again and again :) Definitely worth the splurge on these!